Martyn Collins Digital and Social Media Marketing Services: The single most important innovation for the visitor economy! The single most important innovation for the visitor economy! 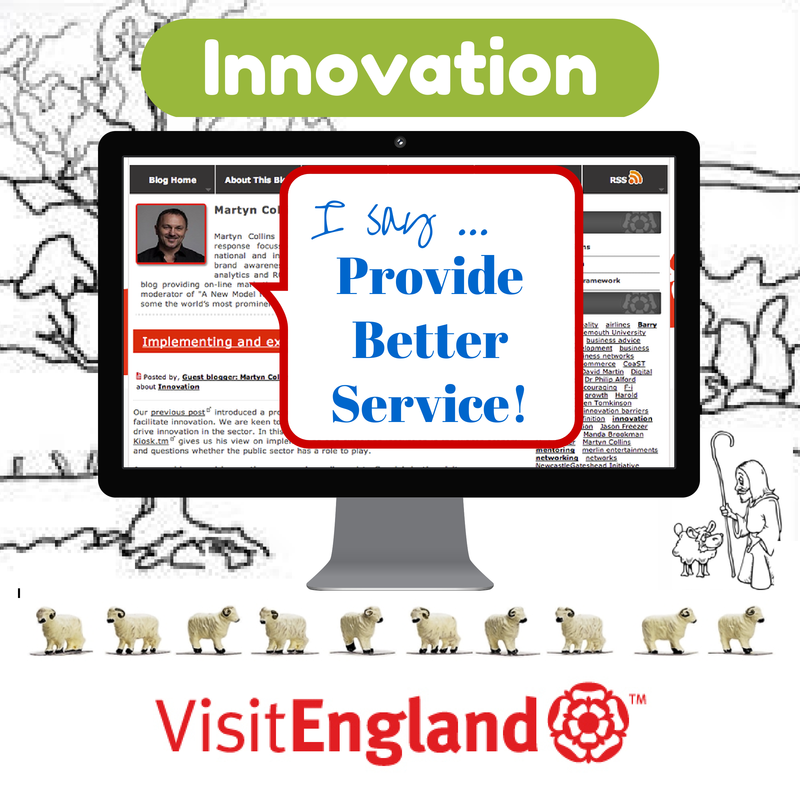 VisitEngland recently introduced a framework of activities and actions to stimulate and facilitate innovation. They are keen to come out of the debate with some tangible ideas of how to drive innovation in the sector. I was one of the people they asked to give a view on implementing and exploiting innovation in the visitor economy and to question whether the public sector has a role to play. Q. Are new ideas and innovative approaches allowed to flourish in the visitor economy or are there barriers? A. The most successful businesses in the visitor economy are those that constantly innovate in response to the ever increasing consumer demand for better service. To this end I believe that barriers to innovation do not exist for those individuals truly capable of innovation. I also know that where groups of individuals are asked to contribute to innovation then you start running into problems. Innovation will not flourish when run by committee, nor will it flourish when group members have competing interests. Q. Should innovation be left solely to the private sector? A. Yes … err I mean No! Business people are often too busy doing what they do to have the time to innovate – or am I just describing someone who is naturally not inclined (or forced) into innovative ideas or practices? We can’t all be innovators, but we could learn to adopt and benefit from innovation more quickly. We can be encouraged to think more innovatively without the pressure of having to invent the next bright new shiny thing. If there is need for co-ordination then the Public Sector probably has a valid role to play. But history shows us that sometimes the Public Sector has got too involved and things got messier than they were before. A shepherd can know that sheep will be better fed in the next field. He expedites this by training sheepdogs to round them up and drive them into that field. Sheep probably never realise the innovation of this coordinated approach – but it’s also a problem they never knew existed. They’d have got to the fresh pasture eventually, one by one. The shepherd and sheepdogs got them all there quicker and at the same time. What a lovely win, win, win scenario! So getting all the sheep to the next field at the same time would never happen without the shepherd. Without the shepherd the sheepdogs wouldn't know what to do. The sheep would not know what to do. However, getting all the sheep into the next field at the same time would also never happen without the sheepdogs. The shepherd would know what to do but is physically incapable of doing the task the sheepdog does. And it would confuse the hell out of the sheep. Q. Is there a need for a coordinated sector approach or is it the responsibility of the individual business? A. The shepherd analogy applied above implies that the sheep needed shepherding – despite the fact that their species has evolved and survived millions of years without the co-ordinated intervention of people. We only shepherd sheep because we want their wool, their meat and the grass cut on the cheap. They never asked us to start coordinating them. The Private Sector does not generally see the need for co-ordination. The coordinator does! It is in the coordinators interest to try and apply co-ordination. When the Public Sector tries to apply coordination where it’s not needed then clearly it will fail. Many species of animal act in a coordinated fashion when it suits them – when the realisation that working together will produce a better individual result than what could be achieved by going it alone. If there is no obvious, tangible reason to coordinate then we all just get on with doing our own thing. Q. Does the public sector have a role to play? If so what is it? A. Where the Public Sector succeeds is when it is restricted to the role of shepherd. Where it fails is where they don’t realise that they are only the shepherd, where they think they need to be the sheepdogs too. Sheepdogs are the Private Sector. Sheep are generally oblivious of the shepherd. But they can readily relate to the sheepdog. Importantly the shepherd needs to be able to see the bigger picture, know what needs to be achieved, identify the appropriate resource, then let the sheepdogs do their work – with minimal and only necessary intervention. Q. Is there a need for better collaboration between businesses within and outside the visitor economy? A. I believe that there is - but this collaboration needs to be at a commercial level where there is mutual benefit. It’s a Private Sector thing. I compared the sector to shepherds, sheepdogs and sheep but of course that’s not at all fair on the sheepdogs or the sheep. In peace-time innovation happens almost exclusively in the Private Sector - the sheep are actually in charge and often ‘employ’ sheepdog to get them to pastures new. But anyway…Innovation. Who has got time for that? I’m too busy trying to make ends meet to worry about that. And the more I think about it the more I’m inclined to believe that Innovation is either a luxury or a necessity. In order to Innovate you must first have a deep interest in the subject at hand. Then it’s about whether you’ve got the time and the money, or if you have no other option. Innovators have time to observe, to reflect, to experiment. They innovate because they can afford to speculate and, importantly, they can afford to fail. However for the vast majority of us Innovation is something that someone else does. Think Innovator and you might think James Dyson for instance. We already had vacuum cleaners and most of us were probably happy with the job that they did. But he thought there was a better way of doing it. An Innovator is someone who looks at something and realises that it could be done better and also understands how to go about making the improvement thus proving their point. Innovation should not be confused with technology. The introduction of online booking technology did not make the entire tourism experience better – it just made booking simpler and more efficient for both business and customer. It became an example of better service. Those businesses who embraced online booking technology found that this was generally a far more effective way to sell their product. But it was led by consumer demand. People wanted to go online to find a hotel, check availability and booking the room all in one sitting. Tourism is of course a service industry. One could argue then that the point at where Innovation should be focused is at the service level. Don’t think about technology – focus on what is going to make the customer experience better. How many times have you had an unsatisfactory experience in a restaurant (or any other tourism based business) that could have been avoided if the establishment had provided a better level of service? When tourism businesses start exceeding customer expectation through the quality of the service they provide that’s when you’ll start to see real growth in the sector. Tourism has the power to change people’s lives for the better and for as long as they live – dementia aside! James Dyson hasn't. No one ever spent time reminiscing about the 20 minutes spent vacuuming the front room. I personally cannot remember a single cleaning experience that I have ever cared to share with anyone. I never share my hoovering experiences on Facebook, or tweet about them, tell my mates down the pub or pin photos of the rugs I've cleaned onto Pinterest. The service Innovation is one where you ensure that your visitors have absolutely the best time they could have to the extent that when they leave your businesses they tell others about it. Those others visit, have the same high quality experience, tell others, they visit etc etc. Innovation in the tourism sector should primarily be concerned with the quality of service - professionalism of staff; quality of food, attention to detail, hygiene etc. Get these right and all else follows. The single most important innovation for the visitor economy = provide better service. As for me, I’m sure I buried a bone around here somewhere!